MONDAY: Who'll be riding the Purple Line? Do they know it's coming? Check out part TWO of our fundraiser coverage. Purple Line Now! debuted its new name at a fundraiser last night at the Montgomery College Student Services Center. With a new name and a new focus, Purple Line Now! 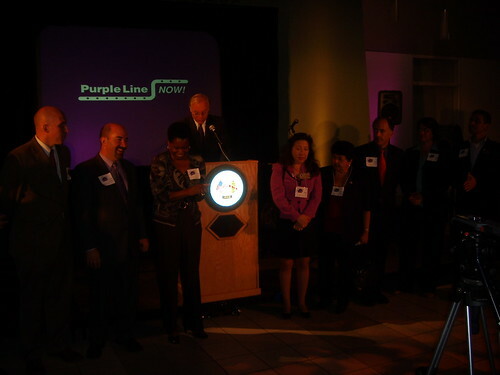 - formerly called the Coalition to Build the Inner Purple Line - made its debut at a fundraiser held last night at the Montgomery College Student Services Center in South Silver Spring. Hundreds of supporters for the controversial proposed transitway between Bethesda and New Carrollton came out to enjoy music from local jazz artist Marcus Johnson - who played at last month's Silver Spring Jazz Festival - and hear speakers including Comptroller Peter Franchot (D), Jos Williams of the Metropolitan Washington AFL-CIO, and environmental activist Mike Tidwell. "I know there are many times when I drove to Bethesda when I would've loved to take the Purple Line," says Tidwell, author of The Ravaging Tide, a book about the effects of climate change. "As someone who takes 94 degrees [on Monday] seriously, I support the Purple Line." 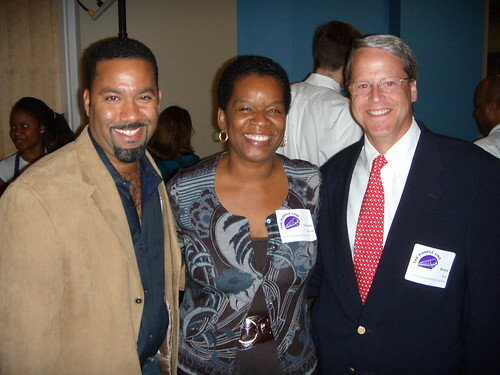 Jazz artist Marcus Johnson, County Councilwoman Valerie Ervin and developer Bruce Lee pose for a picture. The evening's guest list that read like a Who's Who of local movers and shakers. Former Planning Board Chairman Derick Berlage nervously worked the room. County Councilman George Leventhal (D-At Large) networked alongside his wife and son. Bruce Lee of the Lee Development Group, - which plans to build a Fillmore music hall on Colesville Road - schmoozed with Councilwoman Valerie Ervin (D-Silver Spring), who brought her entire staff. Ervin, a resident of Sligo Park Hills - one of many neighborhoods the Purple Line could pass through if built - was unafraid to express her support for the project. "I'd like to see an alignment that puts us in the best position to get built," she says. "The at-grade alignment makes the most sense." State Delegate Jacqueline Peña-Melnyk (D-Dist. 21), one of a handful of representatives from Prince George's County, insisted that her county was fully in support of the Purple Line. "We want it yesterday," she says. 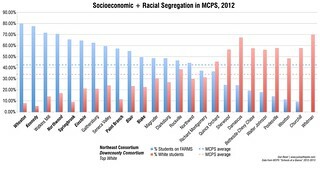 "It's actually on the priority list in the Prince George's County Council. The ICC is not a priority." 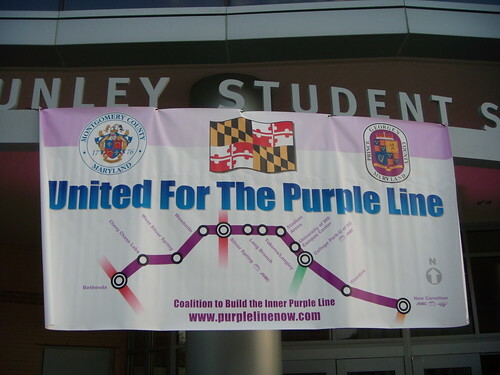 The Purple Line would be a boon for the University of Maryland, which lies in her district. "We need to focus on mass transit, especially in the College Park area," Peña-Melnyk states. "It would be terrific for those students in Montgomery County to take transit [to school]." State Comptroller Peter Franchot and Congressman Al Wynn share a funny with a raft of elected officials. While idealism and good tidings fueled by an open bar dominated the evening, the issue of funding for the Purple Line hung over the event like a rain cloud. The project needs $600 million to get built - money that will come not only from limited Federal funding but Maryland's Transportation Trust Fund as well. "The big issue is will everyone in this room support a gas tax increase to get this money [for the Purple Line]," says Councilwoman Nancy Floreen (D-At Large). The Purple Line's found support in some unexpected - or not so unexpected places - as noted by Lon Anderson of the American Automobile Association, a go-to expert for local news reports about the region's horrible traffic. "We need both a healthy mass transit system and a healthy road system in order to move people in the D.C. area," says Anderson. 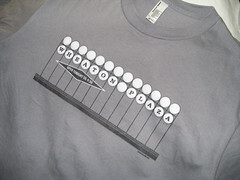 "My grandmother said 'Washington will rue the day they ended streetcars' . . . I'm glad they're bringing them back." One detail - It's Maryland's transportation trust fund, not Montgomery County's. But unless it gets more money (and the $400 million per year proposed by Gov. O'Malley isn't enough), it won't have enough money for major projects like the Purple Line, Baltimore's Red Line, etc. Actually Arturo Sandoval headlined the Silver Spring Jazz Fest. I am a supporter of intelligent transit. I am biding my time to see if the purple line is that. The pep rally/fund raiser seemed to have a "Build it first, then we'll see if we like it'. Valerie Ervin said she's in favor of an 'at grade' allignment. Think it through!! If you simply put street cars or dedicated buses on the same, already clogged streets. how does this get you to New Carrollton any faster? Please ponder the jam at the corners where Fenton meets Bonifant and Wayne. They are clogged from light to light now. Close your eyes and imagine a train track accross those intersections. How's it looking? Keep your eyes closed: Now picture the railroad trestle over Sligo Creek. Drink in the beauty! I am told there is an Austrian company that can do deep tunnel boring at the same cost as 'cut and cover' if they have a long enough distance. I'm in favor of going underground at the SS Metro and not emerging, except at the Arliss Ave Station, until University Blvd. That's intelligent, albeit slightly more expensive, transit. Please folks, don't root for a Purple Line until you know its a good thing. Ask yourself what it serves. One of the cheerleaders above talked about U of M students having a way to Silver Spring. Besides the many currently available routes on Metro Buses/Ride-on they also have the Shuttle-UM - a free ride. This rail line started as a way to get between Silver Spring and Bethesda, connecting the two legs of Metro's Red Line. THAT is what's needed because there is only one way to get between those two hubs -- EW Hwy. Somehow it got extended to a 16 mile train. There are already gobs of ways travel between New Carrollton and SS and Bethesda. Build the SS to Bethesda link first and separate it from the rest of the line, for budgeting purposes. Argue about the best, most intelligent, transit eastward while the NEEDED part os being built. JP: Very good points. However, I personally feel that at the current full-glacial-speed ahead we will NEVER get ANYTHING built below ground. Why don't more people who wonder what an MTA light rail project looks like, and fret over what it means to have it running past their homes, just head to Baltimore and take a look? Head to the Seton Hill station on Howard Street and watch. You might find it to be a snappy alternative to driving. Or you might find it loud, lumbering and a clodhopper. Whatever your opinion it's a lot more informative than the drawings. HOT lanes on the Beltway? Would these be additional lanes to widen the entire Beltway, or would you subtract a lane of existing traffic? If the former, you are talking about BILLIONS of dollars and HUGE community opposition. If the latter, you are imposing worse traffic congestion misery on existing Beltway users. Either way it doesn't sound as simple or as cheap as you make it out to be. Interesting numbers that you make up, that the Purple Line will cost $3 billion and toll lanes on the Beltway would be entirely paid-for by the tolls. Interesting, but completely inaccurate. New numbers will come soon on the Purple Line. The old cost number was $1.4 billion. There's been inflation since then, but the old numbers are based on more tunneling than is now planned. We'll have to see, but it won't be close to $3 billion. Express toll lanes on the Beltway are a real boondoggle. If we estimate the tolls at the same per-mile rate as California's SR-91, the poster child for express toll lanes, the peak one-way toll from US 50 to the American Legion Bridge would be $17. Yes, seventeen dollars one way. At those toll rates, tolls would cover only about a quarter of the construction cost of three or four billion dollars. Taxpayers - most of whom would necessarily find the lanes too expensive to use, since the whole idea is to set the tolls high enough so that most people stay in the free lanes - the taxpayers would have to pay over two and a half billion dollars to subsidize lexus lanes used only by those richer than themselves. anonymous said... loud, boxy, dirty... sounds like every car that ran a left turn light and almost hit my bicycle, today and every day. I will be happy when gas is beyond the budget of all you cronic cell phone users. The Beltway widening scheme is a homewrecking horror. The Purple Line is a homewrecking horror. Neither would substitute for the other, the Md. Transportation Admin. says they have separate justifications -- justifications based upon future population growth. This makes absolutely no sense. Parts of Baltimore, many places in Pa., upstate NY, OH and Mich. are dying for jobs. And all those places have available housing that is far more affordable than housing here. Tearing up stable neighborhoods in Silver Spring and elsewhere in Md. with huge transportation projects that spur subsequent bulldozing "development" is sheer insanity. The purple line would likely go through a few streets, destabilizing a few dozen homes. In the grand scheme of things, this is for progress of the entire region. In the grand scheme, the Purple Line is really only one thing: a boondoggle for developers. And council member Leventhal and his colleagues continue to carry their water. Take a look at who owns or is is buying up commercial and multi-family properties along the route and see for yourself. I agree that the envionmentalists should take a hard look at who really stands to benefit from this Purple Line. The best way to tell is to look at who has been buying up the property along the proposed routes. Check it out. It's all public record if you take the time to look rather than let ideology be your guide. Years ago, a newspaper on Long Island made major waves by finding out who was buying up property along the proposed Long Island Expressway and who had advance knowledge of where the exits would be. Too bad, there's no media here with the balls to look into this. The same holds true about the ICC. Take a look at some of the people who own property along the route--you might be surprised. I believe even Leggett owns a bit of property. So some developers have bought land somewhere near the proposed Purple Line alignment, and this proves a conspiracy...? I challenge you to draw a 16 mile long route anyplace in lower Montgomery County, that does not pass near any land owned by a developer or politician. Of course developers are buying commercial and multi-family properties - that is what they do. Do you expect the Sierra Club to be buying these properties? The fact that one can find property near the Purple Line Route that is owned by a developer proves very little, and does not take away the pressing need for better east-west transit in lower Montgomery County. Better east west transit is a big concern, but putting a train on the roads is not better. The name of this project is SO deceptive. This "purple line" will not be a metro train. It will not go faster than the cars on the road. Better means deep tunnel especially through developed, funtional, already transit friendly areas like downtown Silver Spring. The Purple Line will destroy our lovely Chevy Chase and Silver Spring neighborhoods with noisy, outdated technology. It will destroy the Capitol Crescent Trail where people commute to work, and children sell Lemonade. Bethesda and Silver Spring are doing very well for themselves these days. Why do we need to fix what is not broken? All this line will do is allow developers to build denser in Bethesda and Silver Spring and clog the roads even more. Plus mass transit means people from less desireable communities coming to Bethesda. Silver Spring and PG is full of hobos just waiting to come to lovely, safe Bethesda. Any community that honors some hobo as "mayor" is full of a bunch of ignorant hobos. I would put Ervin, Leventhal into that category. Stop this boondoggle project and invest in our quality of life. So we shouldn't build the Purple Line because it might bring "hobos" from Silver Spring to Bethesda? Just like we shouldn't have built the Red Line, because the hobos from SE DC weren't clever enough to figure out how to ride the 30 buses to Bethesda? Perhaps in addition to hobos, the Purple Line would carry the maids that clean your million dollar house, and the waiters that serve you at the Country Club, and the immigrants that tend your garden and clean your pool. But buses are good enough for those people. What about the ones under the bridge at Silve Spring Metro.? Or the hobo(?) I saw at the Wheaton Metro who was using the parking lot on Price Street as her own public toilet-- Give me a break- I may be opposed to the Purple Line, but not for those reasons- perhaps those people who are so scared of the Hobos' should leave their ivory towers sometime and meet the public. Immigrant haters: focus your anger on corporations that outsource good jobs. Most of these immigrants (AKA Hispanics) do have their own vehicles, friends, or a ride. You cannot survive in America without an automobile. People use transit becuase they either lost their license for drunk driving, don't have a car, or it doesn't make sense to drive financially or time-wise. These spanish people, whether Mexican or Salvedorean are rich. They buy those homes built in the 50's for our returning vets and turn them into boardinghouses. They're even starting to do this in wealthier neighborhoods. This goes against American values and is illegal. Mr. Leggett who supports losening home occupancy standards and advocates neglecting code enforcement in our neighborhoods is destroying many communities. And To that Virginia-loving Maryland-hating freak that also posts here, your piece of sh*t Virginia craphole is the same thing if not worse. Don't bring up your poor, second-rate Nazi-radical state. wow... the blogosphere really is a special place, isn't it? It's a wonderful day in the neighborhood. They seem to like taking the bus enough to take it. From those terrible, gang-run countries where they came from they are lucky to ride on public transportation as clean and efficient as Metrobus or Ride-On. Stop complaining. You won't ever use that Purple Line either. Just another boondoggle project that Takoma Park hobos support so long as it doesn't pass through their neighborhoods. Those closet racists in Takoma Park are happy so long as the spanish people keep away from their white-only hippy neighborhoods. I taking a class on racism at Penn State and I some comments exhibit classical behavior of many Americans. Publicly (when we are not known as "anonymous") we praise immigrants for their hard work and determination, privately there are deep racist tensions. As for the Purple Line. We need this to solve our east-west traffic woes. However we should not destroy communities in the process. Dedicated bus lanes (including converting an existing lane of the Beltway to HOV) on the Beltway would provide immediate relief and not require spending billions. "The Purple Line will destroy our lovely Chevy Chase and Silver Spring neighborhoods with noisy, outdated technology. It will destroy the Capitol Crescent Trail where people commute to work, and children sell Lemonade." "If you ever ridden on the Baltimore light rail you know what a mistake it would be for the same agency to build a new rail line in Montgomery County. Loud, slow, boxy dirty railcars, clunking away down downtrodden businees district streets and along a stream valley instead of hitting major urban centers." You have GOT to be kidding folks. Seriously, are these comments actual concerns about the purple line or jokes? Light rail is not a noisy, outdated technology. You must be thinking of a trolley. Light rail is an incredibly popular and ever-improving transportation alternative. Just look at Europe. They have been using it for years over there and dozens of US cities are following suite. The Purple Line will be far superior to baltimore's light rail because tech improvements since that system was built will make it quieter and it will probably even look sleeker. Also, unlike Baltimore, the purple line will have the right of way at street lights. People ride transit when it is cheaper and/or faster and/or more convenient than driving a car. The purple line can be all of these things even if most of it is at-grade. Also, I can't imagine a more idiotic investment than going around buying up land along the purple line right of way. There is so much uncertainty as to the alignment and station locations and build dates. Why on earth would an investor take such an extreme risk on something as fickle as a federally funded transit initiative? The Purple Line is about Social Justice not tending to the state's most congested transportation systems. That is why I am against it. Build the Corridor Cities Transitway first, then if you have additional funds complete the Capital Crescent Trail into Silver Spring. The most severe traffic problems in Montgomery County are 495, 270, and east west traffic along routes like Randolph Road. The ICC and the Corridor Cities Transitway should help to alleviate some of the traffic on the severely overburdened routes. Silver Spring, College Park, New Carrollton, and Bethesda already have high speed Metro Rail. The developers and sell-out politicians have convinced many people that the Purple Line will be part of Metro Rail with their doctored MetroRail maps. They have also convinced the gullible masses that the Purple line will alleviate auto traffic. In reference to the developers and politicians, to quote Jim Morrison, "You know they are a liar."